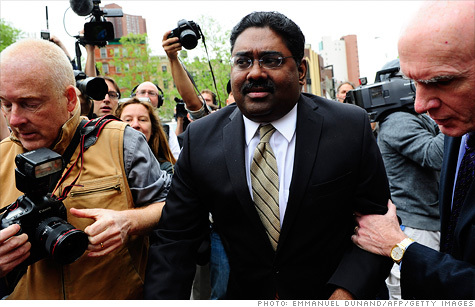 Galleon founder Raj Rajaratnam, shown here on the day of his May 11 conviction for insider trading, was sentenced to 11 years on Thursday. NEW YORK (CNNMoney) -- Raj Rajaratnam, former manager of the defunct hedge fund Galleon Group, was sentenced on Thursday to 11 years in federal prison -- a record for insider trading -- and fined $10 million. Rajaratnam was found guilty on May 11 of all 14 counts of conspiracy and fraud, after netting $64 million on a long-running insider trading scam. He was sentenced at federal district court in Manhattan by Judge Richard Holwell. U.S. Attorney Preet Bharara said the 11-year sentence "is the longest sentence to be imposed for insider trading in history." Rajaratnam will have to surrender to authorities on Nov. 28 to begin serving his sentence. In addition to his $10 million fine, he will have to hand over $53.8 million as forfeited assets and pay a $1,400 court assessment fee. The Sri Lankan-born billionaire's sentence actually fell short of the maximum -- 235 to 293 months -- requested by prosecutors. Rajaratnam's defense lawyer, Terence Lynam, bashed the prosecutors' requested sentence as overly lengthy and "greater than for murder." He said that, unlike Ponzi schemer Bernard Madoff, Rajaratnam didn't victimize anyone and that the ill-gotten gains went to Galleon, not to him personally. Prosecutor Reed Brodsky argued that Rajaratnam's actions did indeed hurt people, because insider trading saps confidence in the financial markets, undermining the economy. Rajaratnam managed $7 billion at Galleon before the hedge fund shut down following his indictment in 2009. The white-collar convict's case featured recordings of phone conversations in which Rajaratnam and his sources blatantly discussed ways to profit from non-public information. In June, a federal jury convicted three others in the insider trading case that centered on Galleon, including former trader Zvi Goffer and co-defendants Emanuel Goffer and Michael Kimelman. It has not been decided where Rajaratnam will serve his time. The federal Bureau of Prisons, not the judge, picks the prison after sentencing. Rajaratnam was sentenced in the same court where Ponzi mastermind Madoff pleaded guilty to 11 counts and received a 150-year sentence. He is currently incarcerated at Federal Correctional Complex Butner in North Carolina. His release date is Nov. 14, 2139.